In response to Uwe Reinhardt’s recent post on “rationing” doctors’ salaries, a number of readers wrote in asking about physician compensation in other countries. Doing a direct comparison of remuneration across different countries is tricky because the same salary may allow for different standards of living in different places. One way to compare cross-country data is to adjust the salaries for purchasing-power parity — that is, adjusting the numbers so that $1,000 of salary buys the same amount of goods and services in every country, providing a general sense of a physician’s standard of living in each nation. These numbers are in the second, fourth and sixth columns of the chart below. 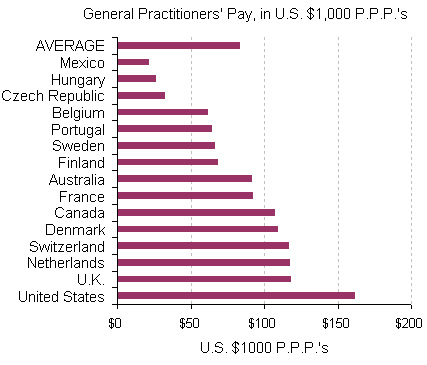 They show that American general practitioners and nurses earn more than their counterparts in other developed countries, and American specialists (insert plastic surgeons & dermatologists) are close to the top of the pack. 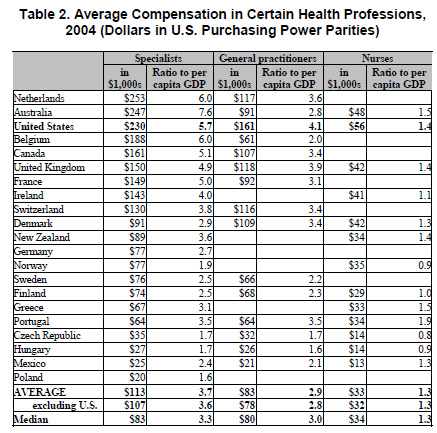 Source: Congressional Research Service (CRS) analysis of Remuneration of Health Professions, OECD Health Data 2006 (October 2006), available at [http://www.ecosante. f /OCDEENG/70.html]. Sorted by specialists’ compensation. Amounts are adjusted using U.S. dollar purchasing power parities. Amounts from previous years are trended up to 2004 dollars using the annualized Bureau of Labor Statistics Employment Cost Index for wages and salaries of health services workers in private industry. It is not known whether wage growth in health professions in other countries was similar to that in the United States. Amounts are from previous years for 10 countries: data for Australia, Canada, Denmark (for specialists and nurses), Finland (for nurses), and the Netherlands are from 2003; data for Belgium (for specialists), Denmark (for general practitioners), New Zealand (for nurses), and Sweden are from 2002; data for Switzerland and the United States (for specialists and general practitioners) are from 2001; and data for Belgium (for general practitioners) and the United States (for nurses) are from 2000. Ratios of salaries to GDP per capita reflect the year the data was collected and are not adjusted for inflation. For countries that have both self-employed and salaried professionals in a given field, the amount presented here is the higher of the two salaries. Four countries have both salaried and self-employed specialists: the Czech Republic (where compensation is $29,484 for salaried and $34,852 for self-employed specialists), Greece ($67,119 and $64,782), the Netherlands ($130,911 and $252,727), and the United States ($170,300 and $229,500). One country has both salaried and self-employed general practitioners: in the United States, salaried general practitioners earn $134,600, compared with $154,200 if self-employed. All nurses are salaried among this data. 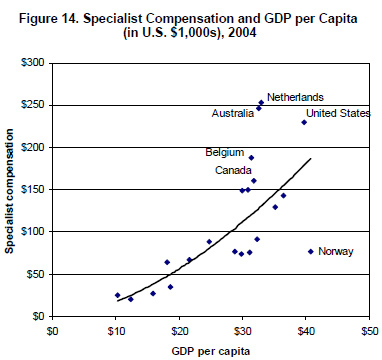 Another way is look at how a doctor’s salary compares to the average national income in that doctor’s country — that is, gross domestic product per capita. These numbers are in the third column, fifth and seventh columns of the chart. Source: Congressional Research Service (CRS) analysis of Remuneration of Health Professions, OECD Health Data 2006 (October 2006), available at [http://www.ecosante.fr/OCDEENG/70.html].